Abe Vigoda was a struggling actor for decades. His first big break was a small, occasionally recurring role on Dark Shadows, the 1960s low-budget haunted house soap opera. A much bigger break was the role of the doomed mobster Tessio in 1972's The Godfather. In 1975, Vigoda landed "Fish," his most famous role, the perpetually complaining, decrepit senior citizen cop on as Barney Miller. 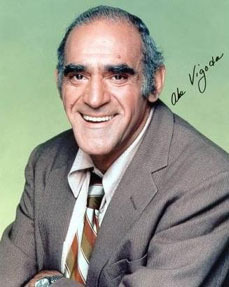 Vigoda was only 54 at the time, and off-camera he was still in good shape, regularly jogging and playing handball. After playing the ancient detective on Barney Miller and its lukewarmly-received spin-off, Fish, Vigoda played old age for laughs in Look Who's Talking (1989) and an ongoing series of even more forgettable films. He played "Sal the Wheezer" in the cartoon Batman: Mask of the Phantasm (1993). People magazine mistakenly reported Abe Vigoda's death in 1982. Decades later, people still stop Vigoda on the street and tell him he looks like the late Abe Vigoda.